Filled with the golden grain of corn this bulgy jar is in its own way a house of bread. Corn is bread for many people of this country just as Bethlehem is synonymous of food for body and soul. The jar tells the story of why it became the house of bread for Christians. A beautiful frieze which decorates the outside wall illustrates in four tableaus the shelter-seeking of the holy couple the nativity in broad composition the magi approaching in haste on lion back and squeezed in between Posada and magi a battle of apocalyptic proportions between angels with pointed swords and the many-headed monster of the nether-world. The nativity dominates. It shows Mary in reclining position holding the child in her arm. She is surrounded in respectful distance by Joseph his gourd and sombrero and angels shepherds and animals. The mostly male figures angels included are dressed in white shirts and trousers and girded with red fabric belts typical of Mexican campesinos. The man in the moon keeps a watchful eye on the proceedings. 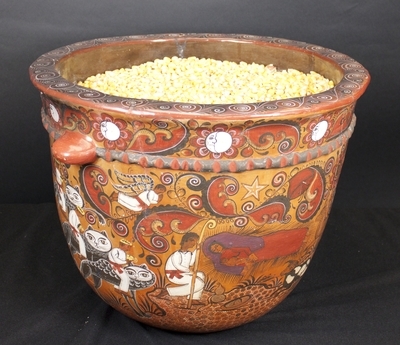 Burnished and glazed clay vase created by Angel Ortiz Gabriel in Tonalá, Jalisco, Mexico, sometime in the 1990s. Exhibition label originally written by Fr. Johann G. Roten, S.M. for exhibit entitled "At The Manger" and held at Roesch Library, University of Dayton.